Never a statement could be more true about a group of fantastic rugby players who finally, after such a long and hard season, made all their hard work and persistence pay off as they won the annual Pennthorpe tag rugby tournament for the first time in Copthorne’s history. Six games of ten minutes was the task ahead of the boys as they turned up after all the snow had melted. There would be some tough teams, some fantastic tries and even better defence. The afternoon started off with a very tough match against previous winners Longacre. A hard fought game went one way then the other with both teams letting their defence do the talking as tries were very hard to come by for both teams. At one point Longacre were up by one and a rare Copthorne mistake gave their coach a bit of a scare but the boys battled back and caused a couple of Longacre mistakes which they capitalised upon both times to win the game 5-4. What a start and what a game to begin with! It would set the tone for the days play. The second game against Pennthorpe was a somewhat easier affair with Copthorne by far the better side, scoring eight tries in the ten minutes and only conceding four. The most difficult game of the day would be against Reigate St Marys who had a strong side. Both teams traded tries throughout a game that was quite physical and unforgiving. Reigate seemed intent on running straight at the Copthorne defenders which eventually was penalised and Cophtorne made it count with a late fightback to draw the game 5-5 and to be honest should have won the game if not for a couple of close calls. By this time the boys were flying and they kept the momentum going with a 6-1 victory over Lancing. I’ve never seen so many tag turnovers against one side in a single game but the boys managed it superbly. The following game gave the boys a well-earned rest before their final two games. Belmont proved to be a tough opposition but it was just one of those days were everything fell into place and the boys won 6-5 in another closely fought game. In the final game the pressure was on against Duke of Kent who had had some impressive victories during the afternoon. The pressure didn’t seem to get to the boys though as another fantastic defensive display saw an 8-4 victory and an end to a brilliant afternoon of rugby. Nobody was sure who would win the shield but it was with a great relief when Copthorne’s name was read out. It was fully deserved! Player of the day was Rohan who put in an all-round performance in attack and defence. Top try scorers were Oliver, Taran and Tobi who scored countless tries during the afternoon. Charlie had an excellent day and showed off some top class passing skills to set up easy tries for his team mates. As usual, captain Freddy lead his troops to victory with excellent organisational skills and motivating comments to his teammates. Harry also had a great day, scoring tries and making tags throughout the afternoon. All the boys contributed in attack and defence and all should be ultra-proud of their efforts. 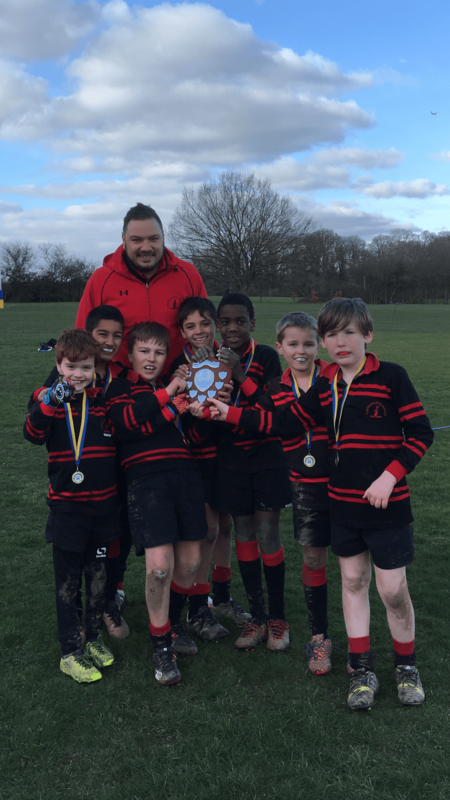 Well done to Tobi, Taran, Oliver, Freddy, Charlie, Harry and Rohan. You’ve put a smile on your coaches face!